Warner Bros. has released the first trailer for Aquaman and it looks awesome. Fans of the character weren't sure if they'd ever see a live-action Aquaman movie until the release of 2016's Batman v Superman: Dawn of Justice when the world got to see, albeit briefly, Arthur Curry shoving his trident at a camera and then swimming away. Though it was later announced that Aquaman would be included in the Justice League movie, fans just needed to see proof of the standalone adventure to believe it. And now the time has almost come to see the finished product. A lot of fans weren't happy with the way Aquaman was portrayed in the Justice League, but director James Wan's vision of the character is a completely different ballgame here. And yesterday's Jason Momoa Aquaman teaser proved they are going all out for fans. The trailer is far from what fans were treated to last summer at San Diego Comic-Con when the debut footage was shown, which makes sense since the film is now nearing completion. DC's Geoff Johns recently talked about what makes Aquaman such an interesting character and had this to say. "Because his father was a human, his mother was Atlantean, and he thinks he's a half breed and he doesn't belong in either world - the surface or the oceans or Atlantis. He kind of considers himself to be a man of no world." 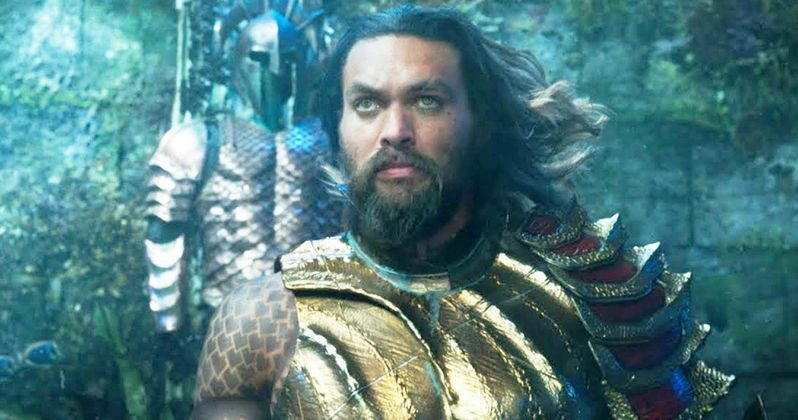 It was announced in August of 2014 that Warner Bros. had hired two screenwriters, Will Beall and Kurt Johnstad to write two completely different scripts for the upcoming Aquaman project. Warner Bros. would then decide which script that they liked the best and production would start after that. It was later announced that Jason Momoa was cast to play the underwater hero and that directing duties would go to James Wan (Saw III) with a script written by Kurt Johnstad. And then, it was reported that David Leslie would provide the script and that the movie was aiming for a 2018 release date. Aquaman began filming on May 1st, 2017 in Australia, and wrapped production at the end of October with a huge party. James Wan has said that the film will have a kind of romantic adventure to it like in the style of 1980's Romancing the Stone, which sounds pretty interesting and makes a lot of sense. DC fans have been waiting to see first footage from Aquaman for months now, so thankfully, Wan did not disappoint in the first epic trailer for the movie that shows hints of those Romancing the Stone vibes. Warner Bros. had originally set up a summer of 2018 release, but the movie ended up getting pushed back twice to its final spot, which is now December 21st, 2018. So, there we have it, the first real look at Jason Momoa as the almighty Aquaman and it looks a lot different than the style of the Justice League, which is definitely a good thing at this point. Justice League really put a damper on the DCEU and Aquaman in particular. His goofy one-liners seemed out of place and made him seem like a joke. James Wan took all of this into consideration while crafting Aquaman, which is evident right away from the latest trailer. You can check out the first trailer for Aquaman below, courtesy of Warner Bros.